-11- results of the information in the questionnaires into a meaningful report for the community, c) to encourage businessmen and others to display the sticker. One practical aspect of this project is that the Commission learned that the [underline]beginning[end underline] of a project is most important. We must be well organized and ready with our own materials before we contact and call upon other groups for assistance. 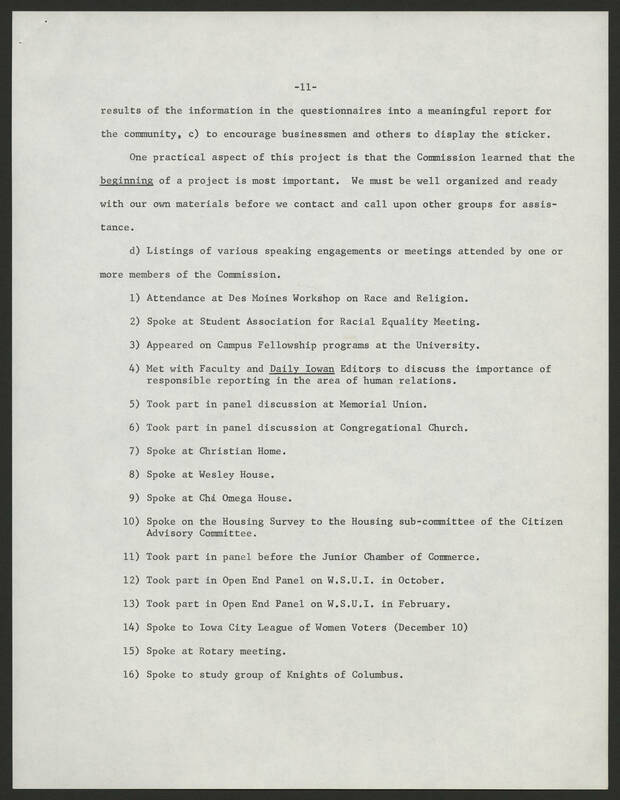 d) Listings of various speaking engagements or meetings attended by one or more members of the Commission. 1) Attendance at the Des Moines Workshop on Race and Religion. 2) Spoke at Student Association for Racial Equality Meeting. 3) Appeared on Campus Fellowship programs at the University. 4) Met with Faculty and [underline]Daily Iowan[end underline] Editors to discuss the importance of responsible reporting i the area of human relations. 5) Took part in panel discussion at Memorial Union. 6) Took part in panel discussion at Congregational Church. 7) Spoke at Christian Home. 8) Spoke at Wesley House. 9) Spoke at Chi Omega House. 10) Spoke on the Housing Survey to the Housing sub-committee of the Citizen Advisory Committee. 11) Took part in panel before the Junior Chamber of Commerce. 12) Took part in Open End Panel on W.S.U.I. in October. 13) Took part in Open End Panel on W.U.S.I. in February. 14) Spoke to Iowa City League of Women Voters (December 10) 15) Spoke at Rotary meeting. 16) Spoke to study group of Knights of Columbus.